Sand is a difficult place for a robot to maneuver. It requires a different kind of design from the traditional. Consider the three most common forms of transportation today: wheels, tracks, and legs. Each of these fail in a sand environment. In the case of the tracks and wheels, they dig into the sand and freewheel. In the case of the legs, they delve deep into the sand, and movement becomes prohibitively expensive. The authors present an alternate method of movement across sand: a crescent shaped �leg� that spins. Six per vehicle, the legs propel the robot by pushing it along, in a walking pattern of two legs and one (tripod style). The authors tested their vehicle in a unique setup to simulate sand without the mess. They filled a tank with poppy seeds, and placed air nozzles on the bottom so that they can agitate the sand to just the density that required. The interesting thing about this project is that the authors are designing their robot using the bionic principle. They�ve figured out that there is a problem of robots failing in sand, and have looked to nature for an example. The crab was a particular inspiration, as well as the zebra-tailed lizard. One thing that I would have liked to see addressed in the article is what a robot that is either a sled design or a mono-wheel design would do in such an environment. Humans have used sleds to travel overland for thousands of years, so that might be a good starting point for another robotic design. Perhaps a pair of sleds where one pushes the other forward, and then they switch roles? 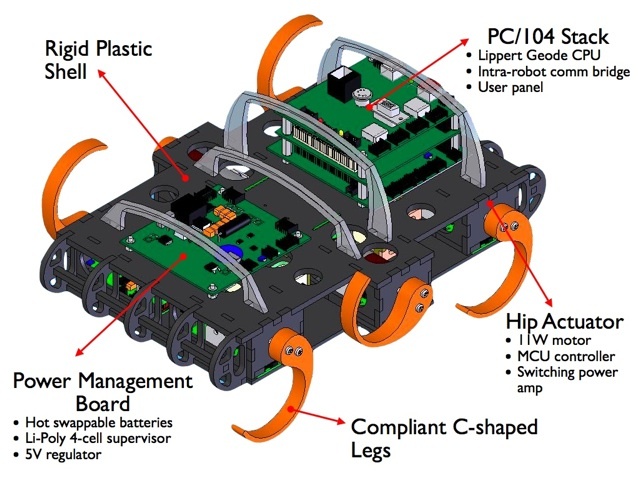 It is a synopsis of the article �March of the Sandbots� by Daniel Goldman, Haldun Komsuoglu, and Daniel Kodischek appearing in the April 2009 IEEE Spectrum.